Hours after Siri leaked upcoming dates for Apple's Worldwide Developers Conference, the company on Monday confirmed its 27th annual WWDC will indeed run from June 13 through June 17 in San Francisco. Developers can now register to take part in this year's ticket lottery. In a press release, Apple said developers can look forward to learn about the future of its four main operating systems: iOS, OS X, watchOS and tvOS. Starting things off will be a keynote presentation at the Bill Graham Civic Auditorium, a venue the company most recently used for its annual iPhone unveiling in September. "With four innovative operating systems and a new, intuitive programming language powering over 1 billion devices worldwide, there has never been a more exciting time to bring our developer community together," said SVP of Worldwide Marketing Philip Schiller. "WWDC 2016 is going to be a landmark event for developers who are coding in Swift, and building apps and products for iOS, OS X, watchOS and tvOS. We can't wait for everyone to join us —in San Francisco or through the live stream." Access to the latest innovations, features and capabilities of iOS, OS X, watchOS and tvOS, and best practices for enhancing an app's functionality, performance, quality and design. The opportunity to connect with thousands of fellow iOS, OS X, watchOS and tvOS developers from around the world —last year, 80 percent of developers attended for their first time, and in total, more than 70 countries were represented. Engaging and inspirational lunchtime sessions with trailblazers and influencers from the worlds of technology, science and entertainment. The Apple Design Awards which recognize iPhone, iPad, Apple Watch, Apple TV and Mac apps that demonstrate technical excellence, innovation and outstanding design. Sessions will be streamed live via the WWDC website and Apple's official WWDC app, though the latter has not yet been updated for 2016. With an at-a-glance schedule, maps, video stream access and an Apple Watch module, the app proved to be an indispensable tool for attendees last year. 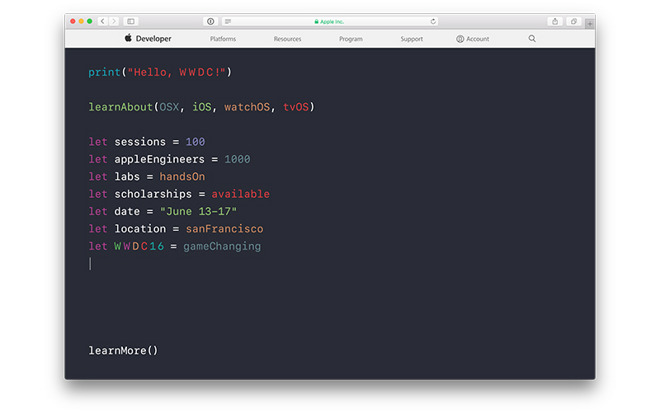 Along with standard ticket sales, Apple is making up to 350 WWDC Scholarships available to students and STEM organization members from around the world. In addition, up to 125 scholarship recipients will be provided with travel assistance. Developers interested in attending can apply to purchase tickets through Apple's official WWDC website now through Friday, April 22 at 10 a.m. Pacific. As usual, tickets will be meted out using a random selection process, and recipients will be notified of their application status on Monday, April 25 at 5 p.m. Pacific.